Why does the U.S. government provide such generous support to Israel? Conventional wisdom points to American Jews, their votes, their political donations, and their well-organized lobbying efforts. Whole books (notably Paul Findley's They Dare to Speak Out and Edward Tivan's The Lobby) have been written to make this point. A. F. K. Organski, professor of political science at the University of Michigan, has looked at the record of American aid to Israel and come to a different conclusion. He observed a striking fact: U.S. aid was very low before 1970 and very high afterwards. Noting that American Jews exerted about the same efforts on Israel's behalf before 1970 as after that date, he asked himself why the dramatically different aid levels? Logic holds that a constant factor cannot explain a variable event; obviously, the author concludes, American Jews cannot be the decisive factor here. To clinch this argument, he points out that it was Richard Nixon, a politician singularly not beholden to Jews (according to Henry Kissinger, he "delighted in telling associates and visitors that the 'Jewish lobby' had no effect on him") who raised the levels of aid. Organski posits a contrary argument for the turn in 1970. For him, the critical change had to do with American attitudes toward Israel's utility. From Truman through Johnson, he shows, American administrations saw Israel as a weak state that could provide no help in the Great Game versus the Soviet Union; if anything, the Jewish state was perceived as a liability. Thanks to the 1967 Arab-Israeli war, Nixon saw Israeli military power as a significant benefit to the United States. This transformation was then completed in the aftermath of the 1973 war. As his previous books, most notably The Stages of Political Development, have shown, Organski has a powerful and disciplined intelligence. In $36 Billion Bargain, he relentlessly applies logic to a large, amorphous body of data, and so goes far beyond the anecdotal montages that have served other authors as evidence. The result is a tour de force which actually settles a highly contentious issue. This rare accomplishment deserves to be rewarded by calling off the old and sterile debate over the Israel lobby. The book is full of insights. Organski shows how it is in almost everyone's interest to forward the myth of the Jewish lobby. Jewish leaders clearly benefit from being perceived as having a decisive impact. Israeli leaders like to believe that they have influential friends. American policy makers exploit the Jewish lobby to explain away decisions that Arab leaders oppose. American opponents of aid love the lobby, for it strengthens their argument that close relations with Israel results from domestic considerations, not a sober assessment of foreign policy. Even Arab leaders cling to the myth, which makes unpalatable decisions made in Washington much easier for them to swallow. 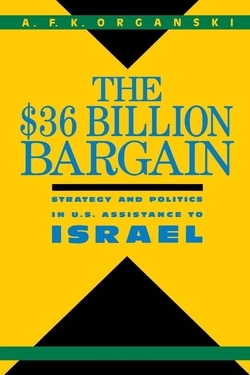 Concurring with Steven Spiegel's analysis in The Other Arab-Israeli Conflict (reviewed in Commentary, October 1985), Organski holds that "U.S. policy decisions with respect to Israel have, in the main, been made by presidents and presidential foreign policy elites both by themselves and for reasons entirely their own." He thereby dismisses not just the Israel lobby but the Congress, the media, the academy, and even public opinion. Most of the $36 Billion Bargain is devoted to proving that the U.S.-Israel connection owes more to this American strategic perception than to the activism of American Jews. The evidence includes a review of American public opinion about Israel, a comparative look at American foreign aid, and the influence of the U.S. over Israel. A finely tabulated account of Senate votes shows that ideology has much more to do with the way Senators vote than the size of their Jewish constituencies or the contributions they receive from Jewish or pro-Jewish sources. And there is another, more perverse impetus: aid to Israel provides the Congress one of those few instances of foreign policy (the Afghan rebels were another) when it can take the initiative away from the legislative branch. "It can demand that aid be increased, scolding bureaucrats and political appointees for dragging their feet, and, in so doing, claim the political credit for supporting Israel, while savoring the pleasure of driving the bureaucracy to distraction." But why is a Congress usually skeptical about foreign aid so enthusiastic in the case of Israel? Organski does not quite explain the anomaly. He quotes a senator to the effect that the Jews are "hardworking," but that hardly suffices, especially in light of the abundant evidence from five decades that aid induces an economic and spiritual dependency. Welfare countries seem to suffer from the same debilitation as welfare mothers: lack of motivation, more interest in politics than entrepreneurship, and poverty. Or, to adopt James Bovard's graphic metaphor, perpetual assistance to poor governments "is about as humanitarian as giving an alcoholic the key to a brewery." The reason for so much aid to Israel has to do with that country being exempt from the powerful critique about aid's unfortunate effects. As Tom Bethell so clearly pointed out in the July 1990 issue of The American Spectator, this has to do in part with the extremely political nature of aid to Israel; financial transfers have turned into the premier symbol of U.S.-Israeli partnership, and thereby become an end in itself. To argue against funds for Israel is tantamount to anti-Israel politics. In part too, because the motives behind the transfers are more military than economic, these are not subject to the usual analysis. But money is money; just because the U.S. Congress thinks of its funds going for F-16s rather than sugar refineries does not lessen the cost to Israel. Looking to the future, Organski sees a decline in U.S.-Israel ties if any of three conditions obtain: the Soviet threat declines, the radical Middle East threat declines, or an Arab ally so modernizes that it becomes a tempting alternative to Israel as the United States' main ally. The author discounts the third possibility, and he is right, for other than Turkey there is no Muslim country of the Middle East on the track of true modernization, and the Turks stay as far away from Middle East imbroglios as they can. What of the first two conditions? From the perspective of late 1990, the threat to U.S. interests from Moscow is declining at about the same speed as that of the radical Arabs, personified by Saddam Husayn, is growing. This combination of trends accounts for the perplexing sight of an American secretary of state pleading with Soviet leaders to send troops to the Persian Gulf. In other words, changes in the region cancel out changes in the world. While Israel is less useful vis-à-vis the Soviet Union, it is more so vis-à-vis the Arabs and Middle East oil, and its overall value to the United States remains fairly constant. If Organski is right about the key to U.S.-Israel relations lying in a hard-headed analysis of American interests, then changes ahead in that relationship should not be as major as many today expect. But the president and his aides need not always be hard-headed about their analysis. It is also entirely possible either out of poor analysis or out of emotional pique. This seems to be exactly what they are doing at present, in their obsessive effort to maintain the fragile coalition against Saddam Husayn. If public opinion and shared values count for as little as Organski suggests, U.S.-Israel relations may be very much more volatile in the months ahead. There is even a small chance that a working alliance nurtured over twenty years will be suddenly and lastingly ruptured.